Yesterday, I published my Top Ten Wines of the Year that I pulled from my own cellar—wines that I had purchased or that I had received as a gift. Based on a few comments and a couple of emails, it was clear to me that some of you actually read this blog for recommendations of wines that you can actually purchase. With that in mind, I went back over all of my posts from last year and pulled out the top wines that I either received as a sample or that I tasted in tasting rooms over the year. In other words, wine that is (probably) still available. During this exercise, I realized that the wine I reviewed this year fell into to two broad categories: Wine from Dry Creek Valley and wine from everywhere else. Today, I will focus on the former. This year was a special one for me as I was formally introduced to the Dry Creek Valley and its many great wines and fabulous people. Although I spent just about a week total in the Valley, I feel that I have a fairly solid grasp of some of the wine being made there, even though there are numerous fine producers that I have yet to explore. 2009 Del Carlo Cabernet Sauvignon: Retail $30. 100% Cabernet Sauvignon. Black currant and a bit of pepper come out of the glass with a bit of a swirl, and some black cherry and mocha are introduced on the palate. The acidity and tannins are wonderfully in balance, leading to a lingering finish. $30 for a Cab this good? That is practically stealing. Outstanding. 91-93 Points. 2011 Dry Creek Vineyard Zinfandel DCV2 Four Clones: Retail $40. This needs time. Let me repeat: This needs time. At first, fruity and rather one-dimensional, but as the evening wore on, the wine revealed some more depth and secondary flavors. Dark red fruit, licorice, cassis–really inviting nose. On the palate, a wave of fruit initially with some chocolate. The finish really wants to linger, but fades a bit too soon. In a year or two? I think this firmly achieves Outstanding. 91-93 Points. 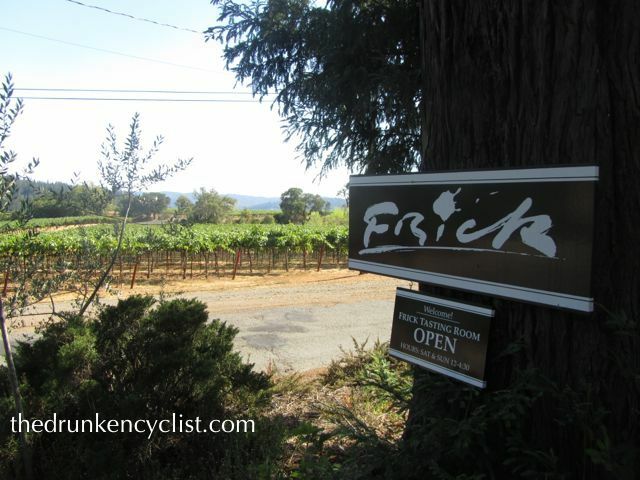 2008 Frick Winery Syrah: Retail $24. Only 70 cases produced and still $24? That’s a bit crazy. And so is this wine. Before he poured it, Bill Frick stated that it was reminiscent of a Côte Rôtie from the Northern Rhône. Had I not tasted through the previous dozen wines, I would have been skeptical. The wine was just that, however. Big and meaty, with great fruit and balance. Outstanding. 92-94 Points. 2007 Rued Cabernet Sauvignon Dry Creek Valley: Retail $45. A spicy, peppery nose leads to a fruity, yet balanced palate, with great structure and depth. This wine has a long way to go—5-10 years easy. Buy a few of these, lay them down, forget about them for at least a couple of years, open them in 2017 (or later) and have a nice steak ready. Outstanding. 91-93 Points. 2011 Unti Vineyards Syrah: Retail $28. I took a bit of time with this 100% Syrah, trying to figure out is it was more new-world (as exhibited by its great fruit) or old-world (a pronounced earthy, spicy component). That is what us geeky wine guys do. In the end, this is particularly delicious with fruit, spice, and just the right amount of tannin. Outstanding. 92-94 Points. 2008 Vineyard of Pasterick Estate Syrah: Retail $48. Big and bold with a multitude of aromas and flavors. I know it is a bit cliché, but I could have simply sniffed that wine for an hour: blackberry, earthy notes, a bit of smoked meat, and white pepper. Wow. On the palate it did not disappoint either, with great fruit upfront, and a depth of flavor that is rare. The finish was long and lingering. While it is drinking very well at the moment, this has a very long life ahead of it. Outstanding. 91-93 Points. I know I said that I wanted to provide you with a list of wines you could purchase now. Well, the following are either sold out or very difficult to obtain. So why include them? Simple. There will be a new vintage for (most of) these wines coming out soon and you should gobble them up since they will not last long either. 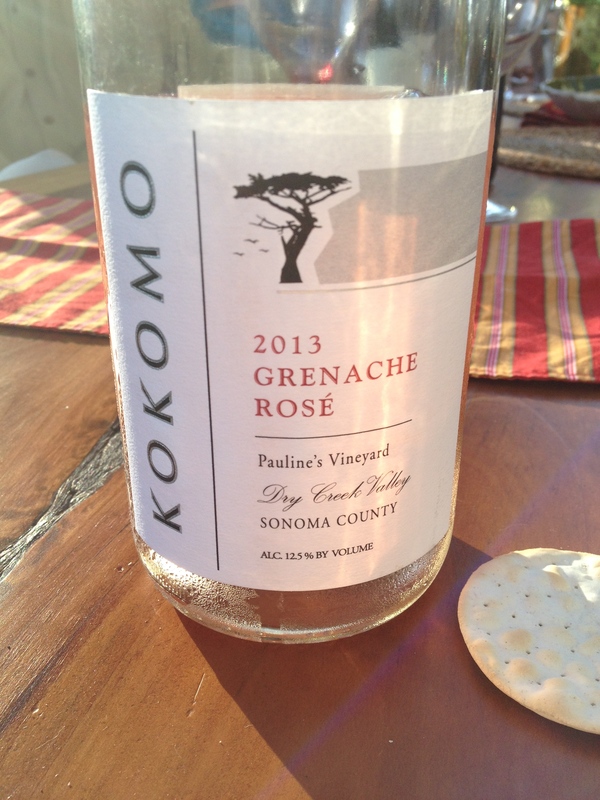 2013 Kokomo Grenache Rosé Pauline’s Vineyard: Retail $24. Erik Miller, the owner and winemaker, makes this wine from grapes that are grown to make a rosé, which makes all the difference. It also comes from one of the best vineyards in the Valley, which does not hurt either. Call Kokomo today and reserve a case of the 2014 rosé—you will not be disappointed. Outstanding. 91-93 Points. 2011 Estate 1856 Cabernet Sauvignon Barrel Reserve: Retail $42. Janice Schmidt, the winemaker and part owner told me that she doubts they will make another Barrel Reserve. You should call her and urge her to do so—it was wonderful. Regardless, this is a label that should be on your radar—all the wines are fantastic. Outstanding. 92-94 Points. 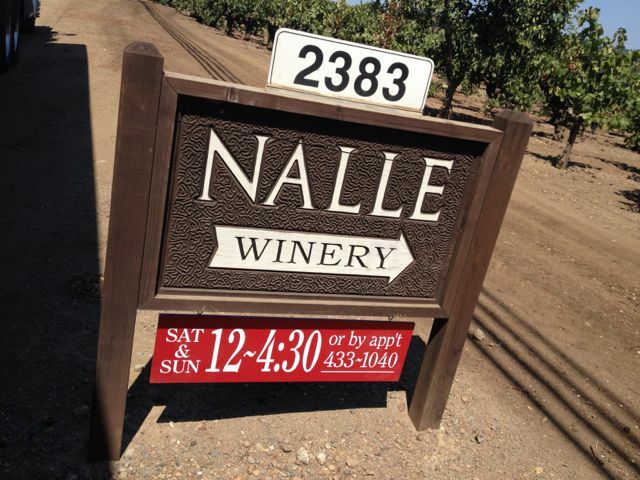 2007 Nalle Dry Creek Valley Zinfandel: Retail ??? I am not sure how much of this is still for sale, but give Doug Nalle a call and see. This was wonderful–great red berry and violet nose, but understandably a bit tight initially. Once it opened up some, it was a show-stopper: fruit, acidity, and tannins in near perfect harmony. A wonderful wine. Outstanding. 93-95 Points. 2013 Vineyard of Pasterick Viognier: Retail $34. I first tasted this as a barrel sample and then a few months later from bottle. This is only available through the wine club, which is more than enough reason to join it. One of the finest Viogniers I have ever had. Outstanding. 92-94 Points. So there you have my Top Ten Wines that I tried in Dry Creek Valley this year. No, I have not visited all the wineries there—I have no doubt that there are many more wines that would vie to be included here, but you will certainly not go wrong with any of the wines listed above. There is one more wine that I need to include, and that would be my Wine of the Year. I know that is a grandiose statement and I would agree that it is virtually impossible to whittle down a year’s worth of wine to one single bottle. There have only been a few times in my life that I have actually had goose bumps when tasting a wine, and this was one of them. It is not really available for purchase (again, unless you are a wine club member, and even then it is difficult to get), but I felt I had to include it here. 2008 Vineyard of Pasterick Angle of Repose Syrah: Retail $80(?). 44 cases produced, only made in the best years. I was lost in the aroma of this wine. If you are a wine lover, no matter what type of wine you like, this wine has to be on your bucket list. I doubt I have ever said this but this wine is other worldly: this will likely change your life. I hesitated to taste the wine since that meant I could no longer smell it. I will not try to describe it here since my words would never do it justice. Unworldly is as close as I can come. Incredible. 97-99 Points. There you have it, another Top Ten list. I plan on posting the final Top Ten List on Friday. This entry was posted in Cabernet Sauvignon, Grenache, Syrah, Viognier, Zinfandel. Bookmark the permalink. It is an amazing thing when you taste a wine that alters the chemical/electrical/emotional balance in your body! My best wishes to you and to your beautiful family in this coming new year, full of wonderful tastes and experiences to you. Abrazos. Thanks so much! To you as well! Thank you for this! Love the DCV wines I’ve tasted and can’t wait to go back. I can’t wait to get back either! Great to see a few Syrah from “Zin Country”! Great list! I think Syrah could outperform Zin in Dry Creek without a whole lot of effort…. I clearly need to do more Dry Creek Valley tasting. These all sound wonderful. Cheers! You really do–under appreciated region with some real bargains!